← Spirit Week Is Almost Here! 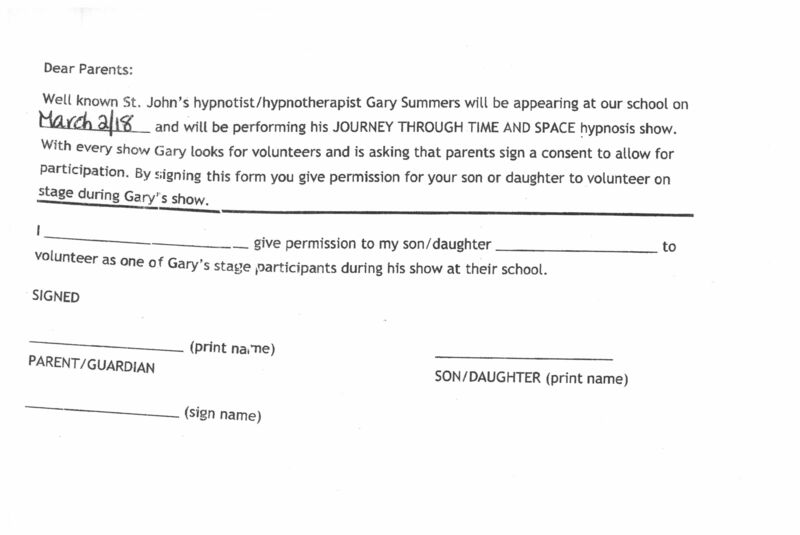 As part of Spirit Week, we are once again hosting the amazing Gary Summers and his hypnosis show. This event is eagerly anticipated every year, and this year is no different! Grade 9 students who would like to participate have to get a signed permission form (available from your homeroom teacher, or by clicking here) and return it before March 1st. Sorry, Grade 7s and 8s, you’ll get to watch the show, but only the Grade 9s get a chance to participate! In order to help cover the costs of this show, we are asking all students to bring in $3.00. Please give this money to your homeroom teacher by March 1st. Note: we want all of our participants to feel safe participating in this show. Therefore there will be no photography or videoing by students of the show. Any phones or cameras observed during the show will be confiscated.